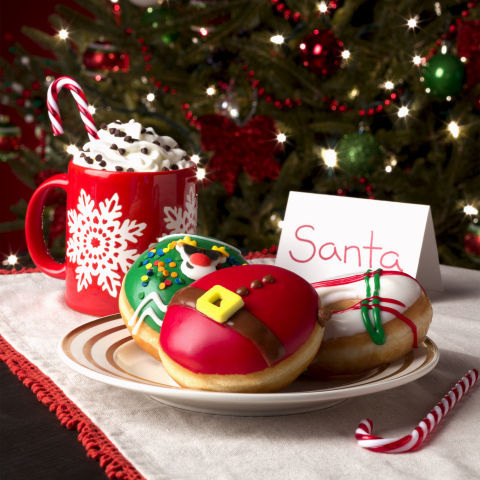 "Krispy Kreme loves being a part of our fans holiday moments, whether they’re taking a quick break for themselves while shopping, spreading cheer at office celebrations, or leaving Santa a tasty treat. 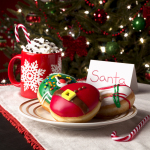 A Krispy Kreme holiday dozen will not disappoint." Spread the cheer and share your Krispy Kreme holiday doughnut experiences on social media using @KrispyKreme and #KrispyKreme. Don’t forget to sign up for our new Rewards Program for special offers throughout the year! To join the program, and to learn more about Krispy Kreme’s latest product offerings, visit www.KrispyKreme.com. Krispy Kreme Doughnut Corporation is a global retailer of premium-quality sweet treats, including its signature Original Glazed doughnut. Headquartered in Winston-Salem, N.C., the company has offered the highest-quality doughnuts and great-tasting coffee since it was founded in 1937. Krispy Kreme Doughnuts is proud of its Fundraising program, which for decades has helped non-profit organizations raise millions of dollars in needed funds. Krispy Kreme doughnuts can be found in approximately 12,000 grocery, convenience and mass merchant stores in the U.S. The Company has nearly 1,400 retail shops in 34 countries. Connect with Krispy Kreme Doughnuts at www.KrispyKreme.com, or on one of its many social media channels, including www.Facebook.com/KrispyKreme, and www.Twitter.com/KrispyKreme.